Vehicle Wrap Bundles using 3M IJ180Cv3 and 3M's 8520 Matte Overlaminate. Your favourite IJ180-Cv3 film, now with micro-technology , providing improved air release, slideability and initial tack optimized for wraps. With a pressure-sensitive adhesive and air release channels for fast and easy, bubble-free graphic installations. This long-term durable and re-movable film has excellent hiding power and stability, making it a good choice for signs and fleet graphics and watercraft, including surfaces with corrugations and rivets. IJ180mC-10LSE is a 2mil cast, conformable print film for hard-to-stick-to surfaces. With micro adhesive technology that provides excellent air release. Ideal for ATVs, motocross bikes, snowmobiles and other motorsports vehicles. A 2 mil film with slideable, repositionable, pressure-activated adhesive and non-visible air release channels for fast and easy, bubble-free installations. 2 mil printable metallic wrap film with micro technology non-visible air release channels for fast, easy, bubble-free installations. A 2mil clear, comformable, print film with micro-comply adhesive. Mix printed images with clear areas to create ultra-cool, never-been-done-before designs with a subtly massive effect. 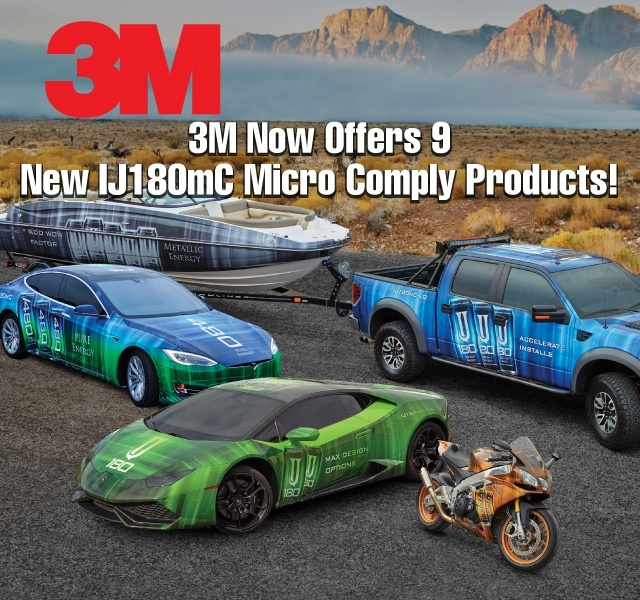 IJ180mC-10-UR is a 2 mil film with Comply Adhesive with Micro Technology that is intended for graphics where fast, easy installation, and clean, easy removal is required. IJ180C-10LSE is a 2mil cast, conformable print film for hard-to-stick-to surfaces. Ideal for ATVs, motocross bikes, snowmobiles and other motorsports vehicles. IJ180mC-10SLS is a 2mil film with micro Comply adhesive has non-visible air release channels for fast and easy, bubble-free graphic installations and provides excellent opacity with a grey adhesive designed to adhere to stainless steel vehicles like tankers, refrigerated trucks and food trucks. A 2 mil cast, translucent film with high strength permanent pressure-sensitive adhesive. 2-mil, cast, opaque white film designed for Solvent, UV, and Latex Inkjet printing. This film features a permanent, pressure-sensitive adhesive and is ideal for cut graphics or single panel graphics and signs. A 2 mil clear film with a pressure-sensitive adhesive. These films are an excellent choice for permanent, medium-term cut graphics or single panel vertical graphics and signs. A 2 mil white film, with a grey adhesive for excellent hiding power. This film conforms to moderately textured surfaces on both flat and curved substrates. For solvent, latex and UV inks. IJ680-10 is a retroreflective film that features flexibility and versatility with slideable, pressure-activated adhesive. This 2 mil, screen printable film with a pressure sensitive adhesive that can be used on flat and simple curved surfaces. Avery MPI 1105 Easy Apply RS series is a 2mil, ultra-conformable, supercast film with a premium PVC face stock with a long term removable (LTR) adhesive. This product must be combined with DOL Z laminate products for Avery Dennison to warrant the film for its full durability. 2.1mil cast, clear vinyl with a gloss finish and permanent adhesive, removable with heat or chemicals. 2mil opaque, conformable vinyl designed for use in demanding applications.